Terry L@u's blog: (2148074274) The target principal name is incorrect. (2148074274) The target principal name is incorrect. When I perform "repadmin /replsum %computername%", I get the error from one of domain controllers in my production environment. 1. At the DC02, log in as Domain Administrator. 3. Right-click "Kerberos Key Distribution Center", select "Properties"..
4. Next to "Startup type", select "Disabled". 8. Enter "netdom resetpwd /server:<Server Name> /ud:<Domain Administrator> /pd:*". After the computer was restarted, the replication from DC02 resumes normal. Did you run the netdom on the server that was ok ? Im having an issue with one server out of our seven and assumed I would run netdom on the server not receiving the replication, but from your post you seem to suggest I should run it on the working machine ? DC02 is the abnormal domain controller, so DC04 can't replicate the AD data from DC02. I performed the above steps in DC02 to fix this problem. Does anyone know why this happens? it keeps reoccuring to us. Replication Error "The target principal name is incorrect." 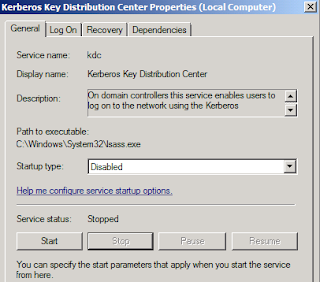 Do we need to re-enable Kerberos Key Distribution Center service?